The September/October Journal opens with a farewell, as Roger Eddy, now retired as IASB’s executive director, shared his thoughts on his career in public education in Illinois. The issue continues with a hello to the next-level trends in 21st-century learning spaces. McHenry SD 15 shared its process for developing makerspaces for “hands-on, minds-on” learning. Spencer Craig, a project manager for Eriksson Engineering Associates, Ltd., brings clarity to the issue of zoning in light of recent court and legislative actions that now define the regulatory framework connecting school districts and local governments. 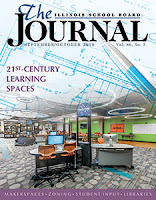 Also, Carrie Matlock of DLA Architects shares the method for facilities development that follows the phrase “form follows learning,” and additional articles include planning for libraries and for students with emotional and behavioral disorders. Check your mailbox for the print edition of the September/October 2018 issue of The Illinois School Board Journal, or click below to read the digital edition. The IASB Board of Directors held its quarterly meeting on Aug. 24-25 in Effingham to review monitoring reports and approve strategic priorities. It was the first quarterly meeting since IASB Executive Director Tom Bertrand took over July 1. The board discussed their expectations for the executive director and was presented with a monitoring report showing indicators of compliance for each Association department. Bertrand also presented his strategic priorities that will guide Association work for the next three years. In a board learning session, Consultant Angie Peifer facilitated a governance policy review to allow newer and veteran members of the board clarify their understanding of the board’s global operational expectations, financial administration, and communicating with the board and the executive director’s interpretation of those policies. The comments and suggestions from this activity will be reviewed by the board’s executive committee. Treasurer Linda Eades presented the financial report and results of the annual audit. Among several committee reports, Conference co-chairs Sheila Nelson and Dennis Inboden updated the board on 2018 Joint Annual Conference planning and activities. Vice President Tom Neeley gave a resolutions report, which will be compiled and sent to IASB members in advance of the Nov. 16 Delegate Assembly. Deputy Executive Director Ben Schwarm updated the board on legislation, as some bills were still awaiting action by the Governor. 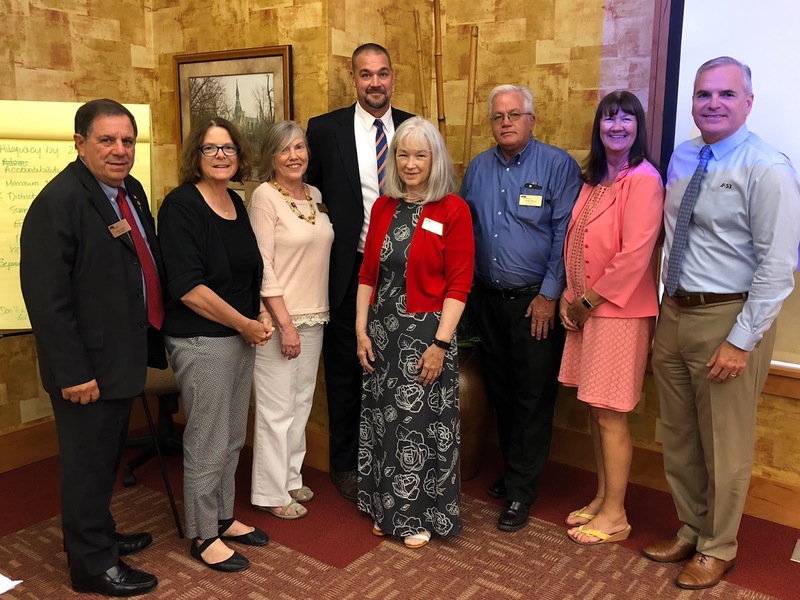 Board leadership shared comments about their involvement in a recent Vision 20/20 meeting to review and refresh initiatives of the policy platform. 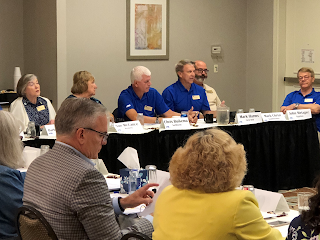 President Joanne Osmond gave a report from the recent National School Boards Association (NSBA) Summer Leadership Seminar. Osmond was elected to the NSBA Policies and Resolutions Committee and Neeley to the NSBA National Nominating Committee. 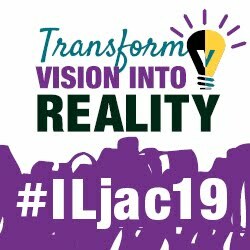 The Board of Directors will meet twice at the Joint Annual Conference in Chicago, on Thursday, November 15 and Sunday, November 18. Illinois lottery supporters and participants commonly claim that the games increase funding for education. But a look at lottery revenue and expenditures shows most of the dollars from lottery sales don’t ever make it to the schools. After 65 cents of every lottery dollar is given back in prize money, and operating expenses swallow another 10 cents, there remains just 25 cents of every lottery dollar going to public schools (2017). But even that remaining money does not boost school funding beyond what would otherwise be provided by the state. Every dollar deposited in the common school fund reduces by a dollar the amount of money that schools get from other sources. In short, the idea that Illinois lottery money adds to education funding is a myth. Education funding from lottery revenue has evolved into a shell game, explains Christopher Mooney, the W. Russell Arrington Professor of State Politics in the Political Science Department at the University of Illinois at Chicago. Mooney explains that if the General Assembly is planning to spend $50 in a year on public schools, then without the state lottery, that $50 would be coming to school districts from the general fund. But, if the lottery provides $10 dollars to the school fund, state officials have two choices: they can either spend that much more money on schools than their intended $50 dollars, or they can lower the contribution from the general fund by $10. Illinois officials have taken the second approach, Mooney says. What is more, lottery monies are only a fraction of state education spending. While the state spends $11.7 billion a year on public education, only $706 million, or 6.1 percent, comes from the lottery. Contributions from the lottery are small compared to the total needs of the state’s 852 public school districts (2017). Finally, although revenue contributions to schools from lottery sales have risen from $668 million in 2014 to $706 million in 2017, the total contribution to schools is essentially unchanged when adjusted for inflation. Governor Bruce Rauner, on Sunday, vetoed the bill which would set a statewide minimum teacher salary of $40,000 by the 2022-2023 school year. SB 2892 (Manar, D-Bunker Hill) would take effect in the 2019-2020 school year by requiring beginning teacher salaries to be at least $32,000 per year, then increasing salaries incrementally over four school years. Each year thereafter, the minimum teacher salary would increase yearly by the rate of the Consumer Price Index (CPI). Lawmakers will take up the bill again in the November veto session when the bill sponsor is certain to file a motion to override the veto. The Alliance opposed the bill in the spring and urged the governor to veto the measure. The veto of the bill was largely due to the advocacy of school board members and other school leaders contacting the governor to urge a veto based on the new mandated costs to local school districts. It is estimated that nearly half of the school districts in the state would be affected by such a new salary requirement. Any gains in funding due to the new Evidence-Based Funding Formula would be totally consumed by the new salary mandate in many school districts. Under such a law, the net result could actually hurt classroom teachers as school districts would be forced to reduce the teaching force in order to pay the higher salaries. Two other bills being watched closely by the Alliance also saw gubernatorial action last week. SB 2572 (Holmes, D-Aurora) would establish a 150 minute per week standard for Physical Education. The bill would roll back the gains in flexibility for school districts that were put in place last year in the school funding bill provision that allows P.E. to be offered three days per week instead of five days per week. The governor vetoed the bill. SB 2428 (Stadelman, D-Rockford) would allow students, regardless of ability to pay, to accumulate a minimum school lunch debt of $500 dollars. Once the $500 dollar threshold has been passed, schools would have to go through a state reimbursement and withholding process to attempt to recoup the money owed. The governor signed the bill into law and it is now Public Act 100-1092; effective August 26, 2018. Click here to read the entire Alliance Legislative Report 100-75, including action taken on other education-related bills. IASB has posted its Annual School Calendar of legal dates and deadlines for 2018-2019. The school calendar is not distributed in a printed version; however, it is posted online so that it is available more quickly and to allow for revisions to reflect any new legislation enacted or the correction of any errors. It is also important to note that the calendar is published for informational purposes only and is not a substitute for legal advice from the school district legal counsel. The Illinois State Board of Education (ISBE) is now inviting nominations of local board presidents for the Thomas Lay Burroughs Award for the state's outstanding school board president. The award was created in 1991 in memory of the late ISBE chairman, who was at one time school board president for Collinsville CUSD 10. 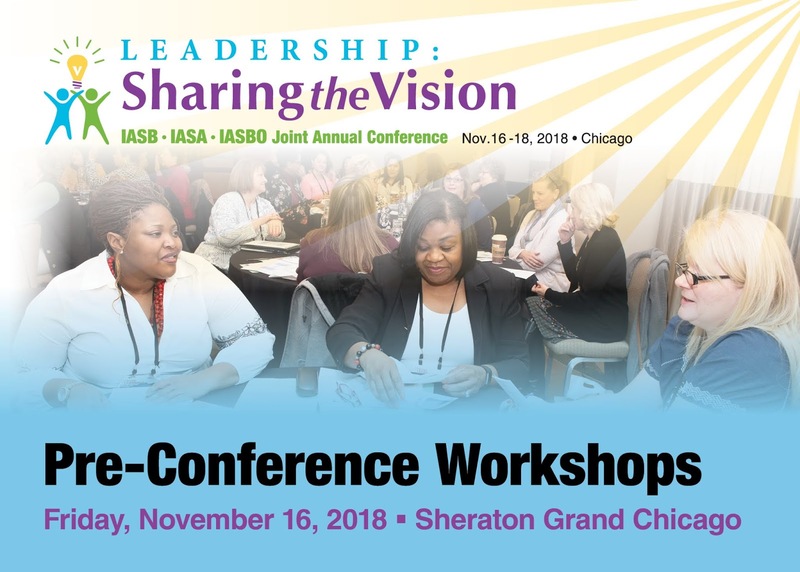 The Burroughs Award is presented annually at the Joint Annual Conference of the Illinois Association of School Boards, Illinois Association of School Administrators, and Illinois Association of School Business Officials. This year’s Conference will be held November 16-18. Leadership in resolving a crisis or major difficulty. Nominations can be submitted to ISBE Board Services Coordinator Katherine Galloway, via email at kgallowa@isbe.net, with “Burroughs Nomination” as the subject. The deadline for nominations is October 5, 2018. Click here for complete nomination information. The schedule for IASB’s 2018 Fall Division Meetings is set. The slate opens with the Western Division meeting in Macomb on September 12, and concludes on October 30 with the South Cook event taking place in Alsip. In between, the Association’s 19 other divisions will meet in venues across the state. Each Division Meeting offers networking opportunities and updates from Association staff, division directors, and division chairpersons. Most meetings also offer keynote or breakout sessions on a variety of important education topics for school leaders. These will be announced at a later date. Online registration is required and can be completed through IASB’s “My Account” at iasb.com. Governor Bruce Rauner has been taking action on various pieces of legislation that have reached his desk since the legislative session concluded. After a bill is approved by the legislature, the General Assembly has 30 days to send the bill to the Governor. The Governor then has 60 days to either sign or veto a bill. While Governor Bruce Rauner has acted on many pieces of legislation, he has yet to take action on several issues including the minimum teacher salary bill (SB 2892, Manar D-Bunker Hill). To see more on SB 2892, click here. Click here for the complete Alliance Legislative Report 100-74, including the list of education bills that have been signed into law. One way for a board to be pro-active in the area of professional development experiences may be to adopt a policy that addresses professional development for all school board members. More specifically, that means adopting a policy that permits and encourages ongoing leadership training for those who have volunteered to serve their community as unpaid school board members. IASB’s Policy Reference Education Subscription Service (PRESS) has a sample policy (2:120, Board Member Development) on this issue. It provides boards with guidance on issues related to setting parameters for board member training. School boards can use the guidance to set parameters on governance concerns (ensuring board members learn, understand, and practice effective governance principles and other best practices). Boards can use that policy guidance, as well, to set parameters on mandatory training, which means training mandated by state law (a list of such laws is contained in the sidebar at right). The major purpose and function of the sample PRESS policy on the topic of board member professional development is to provide information and guidance to staff members, students, parents, and community. It paraphrases the mandatory board member training statutes and provides information to the community (see Policy background information below). The Joint Annual Conference provides both mandatory and governance-related training to school board members and administrators through a Pre-Conference PDLT Workshop and myriad other panel presentations, workshops, General Sessions, and exhibits on school governance and leadership, education funding, student learning and achievement, school law and technology, as well as current education issues and best practices. Also important at Conference are expenses. PRESS has two sample policies: 2:125, Board Member Compensation; Expenses (for board member expenses), and 5:60, Expenses (employee expenses). State law controls both policies’ content (105 ILCS 5/10-9, 5/10-10, and 5/22-1 (no compensation allowed, conflicts of interest prohibited); 105 ILCS 5/10-22.32 (expense advancements); and the Local Government Travel Expense Control Act (ECA) 50 ILCS 150/10 (regulation of travel expenses)). The purpose and function of these sample PRESS policies on expenses are legal compliance (see Policy background information below). Boards should review their existing policies or consider adopting a policy before attending the Joint Annual Conference, which is scheduled for November 16-18 in Chicago. Watch for other material, including sample news releases, that are developed by the Association to assist those districts that want to pro-actively share what they will do and/or did at the 2018 Joint Annual Conference. Sample news releases are customizable and will suggest language that allows districts to specify who attended, how much the district spent, and how attendance fits into the district’s budget and professional development goals. Representatives from the six founding organizations of Illinois Vision 20/20 met August 9 in Springfield to review legislative accomplishments and determine areas of focus going forward. The public policy platform was formed in 2013 to help guide educators, legislators, and other stakeholders to work together toward the common goal of fulfilling the promise of public education in Illinois. Specific policy proposals were developed around four priorities: highly effective educators, 21st century learning, shared accountability, and equitable and adequate funding. The Illinois Association of School Boards was among the founding organizations that also included the Illinois Association of School Administrators, Illinois Principal’s Association, Illinois Association of School Business Officials, Illinois Association of Regional School Superintendents, and Superintendents Commission for the Study of Demographics and Diversity. 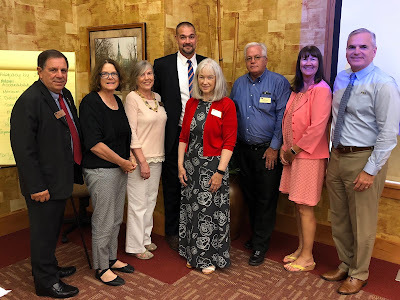 Representing school boards at the meeting were President Joanne Osmond (Lake Villa CCSD 41), Vice President Tom Neeley (Morton CUSD 709), division directors Linda Eades (Northwestern CUSD 2), Simon Kampwerth (Peru ESD 124), Denis Ryan (CHSD 230), Barbara Somogyi (Elk Grove CCSD 59), and Mary Stith (Geneva CUSD 304), and Executive Director Tom Bertrand. and IASB Executive Director Tom Bertrand. While much has been accomplished, the participants identified areas where work still needs to be done. They also shared ideas on how new issues can be defined within each of the four pillars. The meeting was facilitated by ECRA Group, Inc., a third-party educational consulting firm. Outcomes from the meeting will provide guidance for developing new policy proposals that continue the momentum of Illinois Vision 20/20. Information and updates on the initiative will be posted on the Illinois Vision 20/20 website. School districts are required to submit their latest yearly attendance data to ISBE by August 31 under a key provision of the new Evidence-Based Funding (EBF) law. Under the law, ISBE is required to calculate and use districts’ best three-month average daily attendance (ADA), and nine-month ADA, for purposes that range from calculating per capita tuition charges to reckoning payments of school maintenance and energy efficiency grants. The District Average Daily Attendance/Prior General State Aid System in IWAS opened in June for submission of the 2017-18 attendance data. The system mirrors the General State Aid data submission portal used in past years, and it reflects the same district personnel approvals as in the past. Attendance data itself is to be reported the same way as in past years. For questions on submitting the required attendance data, contact ISBE’s School Business Services at 217/785-8779. The state is reminding school districts to complete and submit the Capital Needs Assessment Survey. The survey will remain open for district responses until September 7. Full participation in the assessment will help ensure an accurate portrayal of the capital needs of all districts throughout the state. The survey arises because ISBE and the Capital Development Board are required by Public Act 93-0489 to file a comprehensive assessment report of the capital needs of all school districts with the legislature every two years. January 1, 2019, is the due date of the next such report. District superintendents and regional superintendents were emailed a copy of the latest Capital Needs Assessment Survey on April 16, along with a cover letter. Districts that did not receive a copy of the email have been asked to let the State Board know. Additional forms, if needed, are available on ISBE’s finance webpage or the Capital Development Board website. Completed forms may be submitted by mail to: School Business Services, 100 North First Street, Springfield, IL 62777-0001; or by email at: finance1@isbe.net. For more information, contact Christine Kolaz, ISBE School Business Services, at 217/785-8779. In a brief video message, IASB Executive Director Tom Bertrand introduces himself to Association members and thanks them for their work to provide quality education opportunities for all students. Bertrand goes on to explain his vision for the Association and introduces IASB members to the five Es: Envision, Empower, Engage, Educate, and Evolve. Watch Executive Director Bertrand’s video introduction below. The Illinois Association of School Boards will present its third School Safety and Security Seminar, in conjunction with the 2018 Joint Annual Conference in Chicago, on November 16. IASB’s recent member and superintendent surveys indicated that school safety is the paramount student-oriented issue facing school districts today. At the Symposium, the deep and critical challenges relating to keeping people safe at school will be addressed by local, state, and national leaders in school safety and security, including representatives from the Illinois Terrorism Task Force, Illinois School and Campus Safety Program, ASIS International School Safety and Security Council, and school security advocates. An advocate from the “I Love you Guys” foundation, who had a child in the Sandy Hook elementary school during that tragic incident, will be presenting. School board members and administrators are encouraged to invite their local emergency responders, school resource officers, school security directors, facility directors, and others who help prepare and carry out security procedures on their campuses to attend this important seminar. In addition, eight related safety and security panel sessions are scheduled during the Joint Annual Conference on Friday, November 16, and Saturday, November 17. These will include violence prevention, behavioral threat assessments, monitoring social media to thwart violent attacks, and crisis management, and more. The Seminar will take place Friday, November 16 from 7:45 a.m. to 11:30 a.m. at the Hyatt Regency Chicago. School district personnel who plan to attend the School Safety and Security Seminar must also register for the Joint Annual Conference. Non-district personnel who wish to attend the Conference panel sessions must also register for the School Safety and Security Seminar. Click here for more information, including registration details, on the 2019 School Safety and Security Seminar. Eight engaging topics on school leadership and governance have been selected for 2018 Pre-Conference Workshops. Held in conjunction with the Joint Annual Conference on Friday, November 16, the workshops are offered as either full-day or half-day sessions in the morning and afternoon. Participants can mix-and-match two half-day sessions for the same price as a full-day workshop. Among the full-day presentations offered are Professional Development Leadership Training (PDLT) and Performance Evaluation Reform Act (PERA) Training, The Basics of Governance, Leading Leaders: The Job of the Board President, and Myers-Briggs Type Indicator. The PDLT/PERA course satisfies state mandated training requirements for school board members. Full-day workshops begin at 8 a.m. 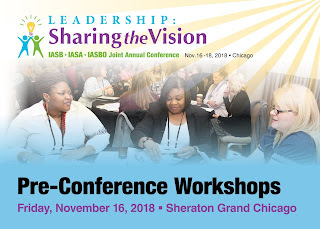 The half-day training sessions, with start times of either 8 a.m. or noon, include Collective Bargaining for School Board Members and Administrators, The Deep Equity Lens: A Systemic Leadership Process, Improve Student Achievement Through eXceptional Governance, and School Board/Superintendent Teams: Leading Intentionally. All Pre-Conference Workshops are a part of the IASB LeaderShop Academy program. A separate fee is required for the training sessions and attendees must be registered for the Joint Annual Conference. Tuition for full-day workshops is $280 and includes breakfast, lunch, and program materials. Fees for half-day workshops are $140, and include breakfast or lunch, depending on the start time. 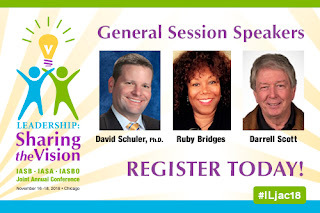 The Workshops will take place at the Sheraton Grand Chicago. Instructions for online registration and a brochure listing workshop descriptions, presenters, and start times are available on the Pre-Conference Workshops webpage.